This is probably old news to anyone who lives in Davenport, Iowa but probably not to you. This is the story of David Jonathan Winkelman, the man who tattooed his forehead with a radio station's logo. I can't decide if he's stupid or crazy... but I know a DJ somehow is to blame. The story of Winkelman's famous tattooed forehead came up after 10 years because Mr. Winkleman got himself arrested. The mugshot was the kind of thing that the internet itself was invented for. Back in 2000, an unnamed DJ on air at 93.5 KORB offered a six-figure payout” to anyone who tattooed the station logo on their forehead. So 48-year old Winkleman and his stepson, Richard Goddard, went to a local tattoo parlor together. In some versions of the story Goddard is described as his nephew. 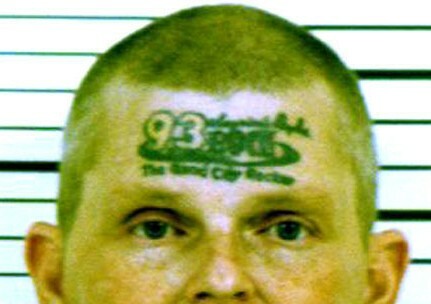 regardless of familial connection, both got a forehead tattoo with the logo and branding for "93 Rock, The Quad City Rocker." Then when Winkleman went to the station to cash in on the deal, the station reneged. The DJ described his on-air statements as a practical joke. As you might expect, Winkleman sued both the DJ and Cumulus Broadcasting (the owner of KORB). Within just a few months of the filing the lawsuit, Winkelman dismissed his own complaint. Goddard filed a separate suit which was later dismissed by a judge for failure to appear in court. When I first heard the story, I thought Cumulus woudl settle out of court for sure. From 1995-2004, the station broadcast an active rock format. But just 4 years after the Winkleman episode, 93 Rock changed format to AC with the new calls KQCS, Star 93.5. Cumulus moved the active rock format to KBOB with the brand Rock 104.9. Nobody yet has tattooed that on their forehead.